Ok, so this post was originally going to be about the new way I would manage my math workshop (not as exciting as it sounds, believe me). But the pictures wouldn’t upload AND I just lost the post completely! Don’t ask me how, but I’ve now taken it as a sign to give up and move on. More about that post tomorrow. So. This made me think of when things don’t work out. 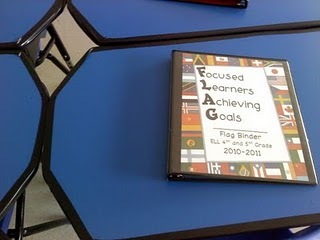 This happens to me all the time, but here is one example: my beautiful FLAG Binders. I was inspired to put these together over the summer by the wonderful teachers over on Proteacher and by Jessica Meacham. It was meant to be a homework management system. Here’s mine. Looks pretty good, huh? I had it all set to go with a homework pocket, a calendar, mini word wall, etc. The only thing was…I didn’t really need it. My class this year is amazingly organized. They hardly ever forget anything, they have their own folders…they are just the most responsible group I’ve ever had. Not to mention, our school has Wednesday folders, to take papers home each week. The mini word walls weren’t really utilized. The whole thing just felt kind of like a waste. I ended up repurposing (that has a red line under it–isn’t it a word?! I’ve heard it a million times on HGTV!) them as note-taking binders. It’s been pretty effective (more effective than the original plan at least). We take notes each day in Math and in Social Studies and Science. The students take notes on loose-leaf paper (from my special paper holder thing!) and then organize notes in the binders at the end of the day (so I don’t have to hear binders snapping open and closed all day. Now the binders are at least being utilized more effectively. I actually like having all of the notes in one binder, rather than a bunch of notebooks too. What items/plans have you had to change? Please tell me you’ve had things that didn’t work out, you amazing teacher bloggers!! PS: This post had several problems as well! I think I’m getting off the computer now! Saxon math has been an epic fail for me this year!! I've been reading Debbie Diller's new Math Workstations book so I've been contemplating all weekend on how to make math work for me! !